This living room is a grand example of the design wonders that interior designers can come up with, given the simplest of living spaces and minimum budget. This otherwise bland room, with the sterile and whitewashed walls and floor could at first sight look uninspiring and dull. 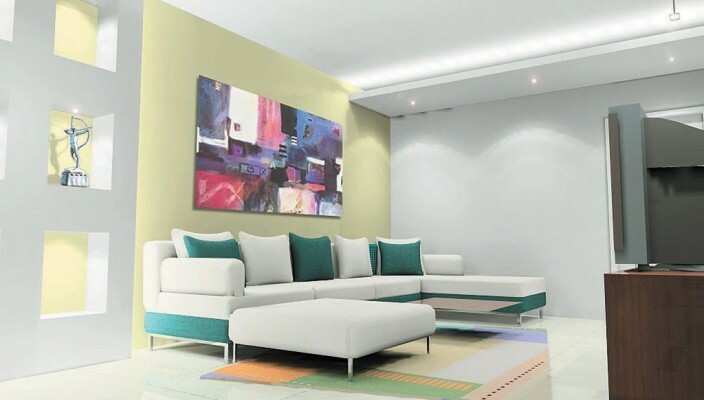 However, the skilful use of colours by merely installing a large painting on the focus wall of the room absolutely changes the ambience of the room giving it an interesting look, set against plain surroundings with minimal design. The sofa set, with alternate colour patterns of green and yellow, that is mimicked by the cushions as well, is once again an example of the smart use of colours to jazz up the room. Both, the sofa set and the table are mounted on chrome stands, on a geometrically patterned carpet in pale hues that does not detract from the focal point in the living space, which is the painting. The seating area stands opposite to the entertainment unit, which is perched upon a deep wooden table.